Greek life has become a way of life for Delta Tau Delta brother Ross Theriault. Ross graduated with a degree in psychology from the University of Maine in 2008, and was a member of the Gamma Nu chapter of Delta Tau Delta. 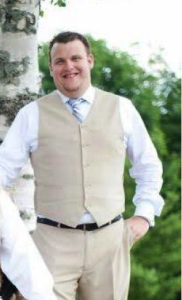 After graduation, Ross stayed at Maine to complete his MBA, and stayed involved in Greek life. Ross has not only supported the fraternity with his time, but also with his finances. Because he believes in our mission, he is a Delta Alpha Kappa society member, and also a member of the Order of the C-, along with his wife. The Theriault’s believe in the value of the Greek experience, and they enjoy being able to give back to something that has given them so much. When you support the Delta Tau Delta foundation, you support the development of community-minded young men like Ross. Supporting the foundation allows us to educate and serve the next generation of men who will one day be leaders in their communities and in our nation. Pledge your support to the Delta Tau Delta foundation, and invest in the brotherhood of the future. You can also learn more about our different donor recognition societies, and consider making an impact at a higher level. Every gift is an investment in future Delt men.